With sunny crisp weather and fall colours in the trees, Halloween is just around the corner. And we've got a great way to bring back that spooooky feeling! Read on about alumni Peter N' Chris and their hilarious Halloween primer, The Mystery of the Hungry Heart Motel. And as always, your BackstagePASS has lots of news from our other alumni, updates and information on department events and another contest! See you soon at the Phoenix! How do you know when something's really funny? UVic theatre alumni Chris Wilson (upper photo) and Peter Carlone (lower photo) get a pretty good idea when they're writing comedy sketches together. The first sign? If they're falling on the floor laughing at it themselves! But even these now-seasoned funny guys, who were nominated for the Comedy Network's Canadian Comedy Award for Best Sketch Troupe this year, say that "You never really know it's funny 'til you play it in front of an audience… but if we're laughing out loud, it's been a pretty good indicator that they will be too. We've learned to trust that instinct," says Wilson. After graduating in 2008, the two best friends morphed into the comedy duo Peter N' Chris and started doing professionally what they began in university: writing comedytogether. They found that their harebrained sense of humour, absurd pop culture references and laugh-out-loud physical gags had a real following. "Our first show was met with just enough success to keep us going. So the following year, we retooled our script and took it on a full cross Canada Fringe tour." They now have four smash-hit shows that have toured across the North American Fringe festival circuits and sketch comedy festivals garnering awards like the "Just for Laughs Best of Comedy" in Montreal, "Best of the Fest" in Winnipeg and "Pick of the Fringe" in Vancouver. 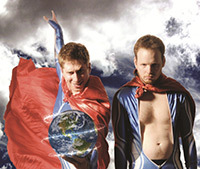 Their unique brand of physical comedy really stretches reality; literally saving the world in Peter N’ Chris Save the World (photo below) or just learning how to pay the rent in The Peter N’ Chris Show (the original). 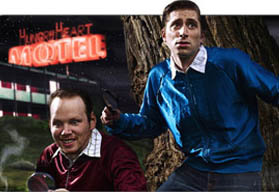 In The Mystery of the Hungry Heart Motel they take on a psycho-killer and the entire “whodunit” detective story genre and their most recent show which debuted in Vancouver this summer, Peter N’ Chris Explore their Bodies, does... well... exactly that! It's a busy life on the road, touring from one Fringe to the next, from Montreal to Victoria from May through September, with other SketchFests from Seattle to Chicago during the rest of the year. With almost 200 performances under their belt, that's a lot of fast food and a lot of time spent together. "We're pretty much like brothers now. We fight like brothers too, but Peter's just like family to my family and vice versa," says Wilson. While here at UVic, they'll also have an opportunity to mentor current students and share what they've learned at talkback sessions after the preview shows. What will they tell these younger versions of themselves? "I would tell them to try every different kind of theatre you can, because you need to find what you love doing, and then do it!" says Wilson "University is a unique time in your life. You should make as many mistakes as you can while you're at the Phoenix." 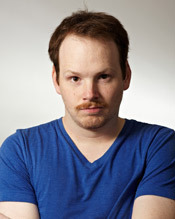 Referencing his many collaborations with other theatre grads, as well as his friendship and comedy partnership with Carlone, Wilson adds his other words of advice, "The people you go to school with now are the people you may be working with in the future, and you never know which one of them it might be! Make good friends while you're here. You may just have them for life." Join the artists for a talkbalk session following the show and learn more about their tactics for success on the Fringe circuit. You'll "die" laughing at this classic whodunit spoof of The Hardy Boys meets The Shining! Our hilarious heroes stumble across a series of murders at a seedy roadside motel. But who could the murderer be? Okay, the answer is the motel manager – but that’s not the real mystery. Maybe the mystery is why their mattresses are so dirty? Or what this dynamic duo might learn about themselves when they check in? If they ever check out! Hot off of a sold out Fringe circuit across Canada and recently nominated for the Comedy Network's Canadian Comedy Award for Best Sketch Troupe, this physical comedy team of alumni from 2008 returns to the Phoenix with their hare-brained sense of humour that while paying homage to pop culture, pushes everyday life into complete absurdity and has earned them a cult following in the festival world. Welcome back guys! "The Making of an Actor – The Making of a Comedian?" Join Denise Read for a special matinee performance of this play with sign language interpretation. Denise is a drama teacher, actress, author, director and song-writer who brings her unique theatre and interpretation skills to illuminate this play for our Deaf and Hard of Hearing community. Set in modern-day, industrial China, Brecht's famous play is even more relevant today as a parable on how hard it is to be a good person in an imperfect, money-centric, class-divided society. When three gods arrive in a large manufacturing-based city in search of one good person, they have a difficult time until they find a young prostitute, Shen Teh. For her kindness, she's granted a new life and the ownership of her own tobacco shop. She strives to be a "good person" in a world based on theft, deceit and corruption, where everyone takes advantage of her generosity. To avoid financial ruin, she invents Shui Ta – a shrewd, no-nonsense male cousin. But in trying to protect her business interests, can she still remain a "good person?" Thinking of coming to two shows this year? For only $48, the cost of two tickets (weekend evening price), you could subscribe to our 2012/13 season and see ALL FOUR shows! Or attend 3 plays for only $36. Details at www.phoenixtheatres.ca. Order through the Phoenix Box Office by calling 250-721-8000 or fill out this easy subscription form. Or, try us out first! Come to Peter N' Chris and if you're having an great time and upgrade to season tickets after the show, you will be entered to win a series of mystery books from the Cadboro Bay Book Compay! UVic Takes TIFF: UVic Theatre Department alumni have hit the red carpet for this year’s Toronto International Film Festival! They star in a pair of short films that each offer drama, mystery, science fiction and fantasy, all in under fifteen minutes. Shaan Rahman (BFA ’11) stars in Bardo Light (click to see trailer) a short written and directed by current UVic Writing student Connor Gaston and produced by alumna Sandi Barret (BFA ’12). Rahman plays Farnsworth (photo above), a man accused of killing his own father – but when he’s brought in by the police for an interrogation, Farnsworth insists that the real culprit was his television set. Meanwhile, in the short film Frost (click to see trailer), Emily Piggford (BFA ’11) plays Naya, a young arctic hunter (photo below). Naya’s search for food in the winter wasteland leads her outside a sacred boundary… and into an unbelievable discovery. 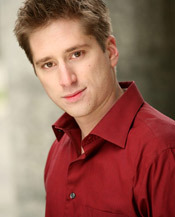 The short was written and directed by Vancouver-born Jeremy Ball. Both actors are also interviewed on Criticize This, a Canadian entertainment website. Rahman talks about the marriage of science and spirituality; the body language of his performance; and the pleasures of doing goodwork in“a small city, on a small island,off the coastof ahuge country,” while Piggford discusses femaleaction heroes, acting on a green screen, and her past collaborations with fellow grad Andrew Barret (BFA ’11), co-founders of Impulse Theatre. Carol-ing with Faculty and Alumni: Jan Wood, the UVic Theatre Department’s Assistant Professor of Acting, will be appearing in the Belfry Theatre’s 2012 production of A Christmas Carol. During the November 13 – December 16 run, Wood will be playing Mrs. Fezziwig… alongside her real-life husband and Victoria theatre mainstay Brian Linds, who plays Mr. Fezziwig. Also appearing is Phoenix alumna Celine Stubel (BFA ’02), who plays Mrs. Cratchit and was last seen in the Belfry Theatre’s production of God of Carnage. 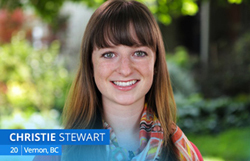 Phoenixer Has Oz-some Summer: Current theatre student Christie Stewart was recently seen on CBC’s reality competition show Over the Rainbow. This nationwide talent competition searched for the best, most musical actresses to take the part of Dorothy in a new Toronto production of Andrew Lloyd Webber’s The Wizard of Oz adaptation, and Christie placed in the Top 20 across all of Canada. Congratulations, Christie! On the Tour Bus: Alumnus Chris Adams (BFA '10) has his transit lined up for the next few months. Chris will be playing one of the multiple hilarious characters on The Number 14 as Axis Theatre Company takes this much-loved play on tour across BC and parts of eastern Canada for it's 20th Anniversary. Alumna Sarah Wallin (BFA '04) is the stage manger for the tour. The bus has already stopped at UVic's Farquhar Auditorium last week but continues up island, to northern BC and Vancouver over the month of October. Win tickets to Good Person of Setzuan (November 8 - 24) at Phoenix Theatre. Answer the following question. What is the name of another play written by Bertolt Brecht? Correct answers will be entered into a draw for a pair of tickets! Email your answer before October 20th to win!